This Catholic Union of Texas KJT Health Insurance Company Review details information about LaGrange, Texas-headquartered Catholic Union of Texas and KJT Insurance Services, LLC. The Catholic Union of Texas helps members of the Catholic faith and others to buy competitively priced health insurance and other important financial services, such as life, home, vehicle (such as auto, motor home, recreational vehicle, motorcycle), or boat insurance. Costs of health insurance continue to increase. That is why the Catholic Union of Texas KJT Health Insurance Company helps their members compare health insurance rates. Compare your health insurance rates with free health insurance quotes from competitive insurance companies. Submit your zip code to initiate the delivery of free health insurance quotes! The organization also helps members compare the costs of Medicare supplement and long-term care insurance. Read on for more information on how to contact this provider, the company mission, agents and member benefits. Catholic Union of Texas has a President, Spiritual Director, and State Officers positioned throughout Texas. Contact the KJT newsletter with any news at [email protected]. The company employs about eight people and was founded in 1889. According to Dun & Bradstreet, KJT Insurance Services, LLC generated approximately $7.75 million in revenues in 2010. The company derived a yearly net income of about $247,920 on revenues. That location generated annual sales of approximately $358,000 during fiscal year 2010. The Catholic Union of Texas is a non-profit organization that seeks to help its members in social, spiritual, and financial security pursuits. The organization holds events throughout the year aimed at bringing members of the Catholic faith together for purposes of community-building and spiritual sustenance. The Catholic Union of Texas hopes to assist parishes within Texas with low-cost loans and other financial assistance. Members of the Catholic Union of Texas may work with KJT Insurance Services, LLC to perform financial, estate, and tax planning. Any member of the organization with a desire to offer financial support to the Catholic Union of Texas may structure gifts using annuity contracts. They may also donate appreciated securities or structure other gifting programs for the benefit of the organization. The organization also seeks to preserve cultural heritage associated with many of its members originating in Germany and Eastern Europe. The Catholic Union of Texas hopes to preserve Czech language and traditions within its membership. The Catholic Union of Texas KJT Health Insurance Company employs proprietary insurance agents to assist members with their insurance needs. Agents work in one- or two-person offices throughout the state to review existing health and other insurance policies in force. Making sure members do not pay too much for health insurance is only one of the goals of the Catholic Union of Texas KJT insurance agents. 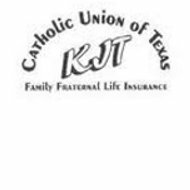 Insurance agents interested in working with the Catholic Union of Texas should indicate an interest by contacting the head of marketing at KJT Insurance Services in LaGrange, Texas. Members join the Catholic Union of Texas by purchasing products and services from KJT Insurance Services LLC, or by donating to any of the organization’s programs. The Catholic Union of Texas supports Youth Camp (for children aged 9 to 12); Youth Clubs; Flag Day; Religious Scholarship Program; and the KJT Activity Center. The Catholic Union of Texas supports Catholic schools and manages a CCD Grant Program. Schools requesting grants from the organization should work through the membership of their area Catholic Union of Texas society. Matching funds are available for the benefit fundraising efforts of communities and parishes. The project of interest to any local society may be submitted to the home office for consideration. Individual or family members in need may submit requests for assistance from the Catholic Union of Texas. Members of the Catholic Union of Texas receive prescription medicine discounts through the ScriptSave program. The Catholic Union of Texas KJT Health Insurance Company offers free health insurance rate comparisons to save members money on annual premium costs. You can save money on your health insurance rates by requesting health insurance quotes now. Enter your zip code to get quick information to save you money!